HITATSURA, or more quiet forms. ITAME-MASAME. See ZENJO for UJIFUSA(1). O-MIDARE in NIE and NIOI. Hachi 8th year, 1603 (the year Iyeyasu took the title of Shogun). includes Nyudo to his Mei. Tei-kyo Ni-nen. Nakago are TakanoHa Yasuri to Haagari Jiri. KANETOKI SHO-O: KANE form: KIN "Gold". From MIKAWA. TOKUIN Line. Shinogi-Tsukuri, Ihori-Mune, deep curve Sakizori to elongated Chu-Kissaki. Bo-Hi on both sides. Carved Suken in the Koshi-Moto. Running Itame Hada with Ji-Nie. Notare Gunome-Togari Ba. Deep Nioi-Guchi with Sunagashi, Kinsuji and Mura-Nie. Midare-Komi Boshi has Maru where Omote has streaming Hakikake and Ura is Kuzure. Tight Itame, Mokume running Shirake Hada has Ji-Nie. Large swells Asaki-Notare has leaning Gunome-Midare has Ashi and Yo. Sunagashi pulls Nijuba Kuzure Ba. Ko-Itame Hada runs along the Mune. Asaki-Notare with Gunome-Midare in Nioi and fine Ko-Nie, that becomes Ara in places. Sunagashi brushes through the Habuchi. Saagari Hakikake, Ko-Maru Boshi with deep Kaeri. 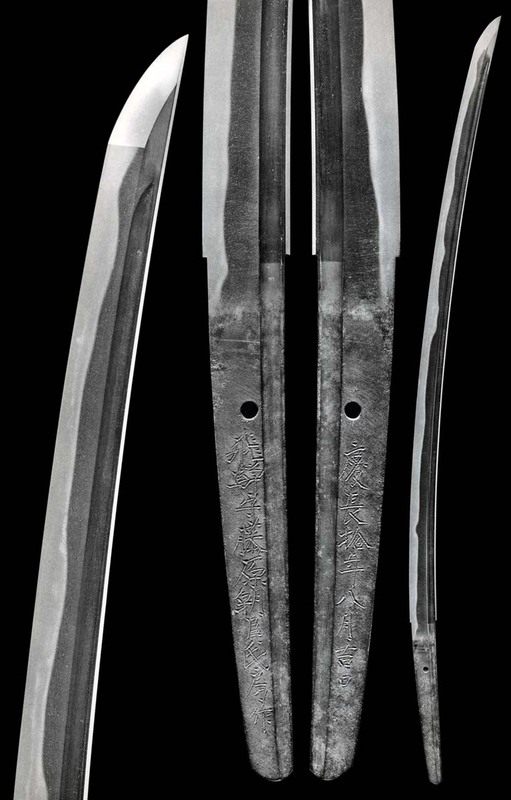 Wide, strong Shinogi-Tsukuri, Ihori-Mune, slight curve to elongated Chu-Kissaki. Standing Ko-Itame Hada has strong Ji-Nie and Chikei. Yubashiri drifts up from surface Nie. Ko-Nie Hiro-Suguha with KuichigaiBa. Sunagashi and Kinsuji cut through the Habachi of Ashi-iri and Yo. Sugu O-Maru Boshi of Hakikake has medium Kaeri. Naginata Hi, Mitsu-Mune, wide and deeply curved. Notare and Gunome mixed in Nioi-Fukashi and Ko-Nie. Notare-Komi Jizo Boshi with deep Kaeri. Clearly standing Itame Hada that runs. Notare holds islated Gunome with Ashi that is swept and cut with Sunagashi and Ko-Nie. Notare-Komi Saagari Boshi with Maru Kaeri. Ubu Kurijiri Nakago has two Mekugi-ana, one filled. 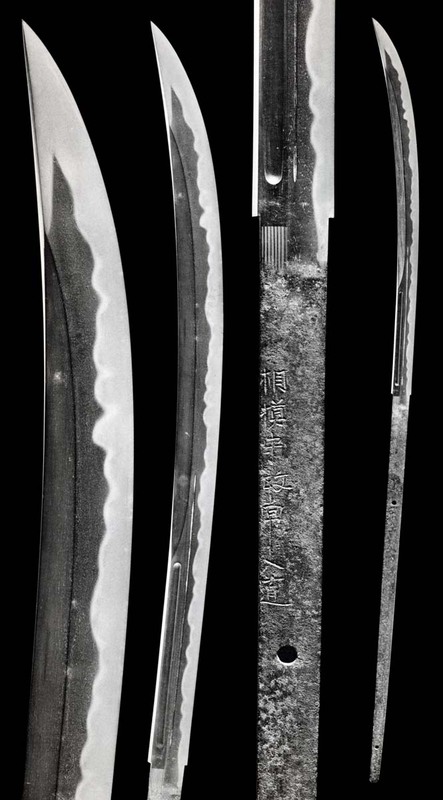 Ko-Itame Mokume mix, standing Hada with Ji-Nie. An energetic and billowing O-Midare Gunome-Midare throws Tobi-yaki into the Ji. Sunagashi streams through high-standing figures. In clear Nioi-Fukashi, Nie and Ara-Nie. Hiro-width Midare-Komi Boshi to Ko-Maru. Ubu Haagri Kurijiri Nakago with one Mekugi-ana. From OSAKA to OWARI. NAGOYA JU. A tight, flawless JI-GANE shows OSAKA style MOKUME HADA. GUNOME-NOTARE KUZURE BA has running SUNAGASHI through the HABUCHI. 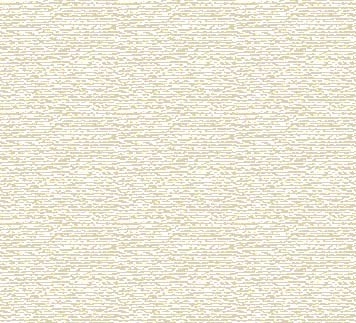 NIOI-FUKASHI and profuse NIE. SUNAGASHI whisks from the CHU-SUGU BOSHI. KAEN and straight-falling HAKIKAKE Kaeri.